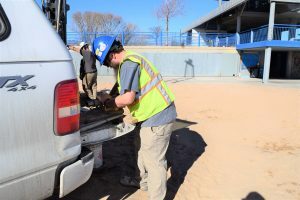 Geotechnical Engineering – Martinez Associates, Inc.
Martinez Associates personnel have provided geotechnical engineering services for a variety of projects in Colorado for over 30 years. We have an intimate knowledge of the unique geological and geotechnical conditions in the Front Range and throughout the Rocky Mountain states. We have worked extensively in subsurface conditions with expansive and collapsible soils, sedimentary and hard rock formations, and areas of geologic hazards. Martinez Associates senior staff have provided geotechnical services for projects throughout the United States and the projects have included commercial buildings, visitor centers, water and wastewater facilities, highways and roadways, bridges, airports, parking structures, light/commuter rail transit lines and stations, dams and flood control structures, military facilities, retaining walls, and other public and private buildings. Martinez Associates utilizes contract drilling firms as opposed to having in house drilling equipment. We believe this allows us to utilize the best equipment to meet the project specific subsurface conditions, whether it be standard solid stem auger drilling, ODEX drilling for hard rock and cobbles or coring to obtain rock or less disturbed bedrock samples. By using contract drillers, we also have the ability to utilize the driller with the right equipment and with the earliest availability. In some cases, this has reduced the field investigation schedule by several weeks. Martinez Associates maintains an AASHTO accredited modern and fully equipped laboratory for the evaluation, design, and testing of soils, bedrock, concrete, and asphalt. Laboratory tests are performed by trained, experienced and certified technicians. Once the field and laboratory investigations have been completed then the engineering analysis and report preparation can be performed. Whether it’s a building, bridge or retaining wall, the most appropriate foundation system is selected based on geologic and groundwater conditions, lateral and vertical load demands, and construction considerations. We have extensive experience with small projects in complex geologic conditions as well as large multi-story buildings. Foundation systems we have provided recommendations for have included spread footings/mats, driven piles, micro-piles, drilled shafts and post-tensioned and conventionally reinforced slabs. For projects such as pipelines, reservoirs and slopes, the engineering analysis may entail the existing and proposed slope stability as well as slope stability under rapid drawdown conditions. Stability may be for both temporary as well as permanent long term conditions in which soil and/or bedrock softening must be considered. The factors of safety considered for these conditions vary and, in some cases, the client must consider the costs associated with obtaining a factor of safety and the risk of failure in comparison to the existing conditions. Martinez Associates provides pavement design services in conjunction with geotechnical services. Our recommendations may include new pavements and rehabilitation of existing pavements. Our engineers are capable of providing design and analysis for full-depth asphalt or concrete and composite sections. We can also provide the pavement survey of existing roadways to evaluate the costs and effectiveness of complete replacement or patching and milling and overlaying. Our staff is experienced with design procedures adopted by the FAA, AASHTO, Asphalt Institute, Portland Cement Association, the Army Corps of Engineers and the Metropolitan Government Pavement Engineers Council (MGPEC). We are also capable of developing designs using the recent mechanistic-empirical approach now being used by CDOT. Existing pavement structural section assessment is frequently performed using several methods such as falling-weight deflectometer, ground penetrating radar, or coring, and the results of each are then compared. We have been successful in providing and receiving approval for alternative, non-traditional pavement designs. This has sometimes resulted in a considerable cost savings to the owner.